Philip John Jeffries, 90, formerly of Weatherly, died Sunday, May 3, in Lancaster at Willow V V alley, where he resided. His wife Maxine and daughter Janet were at his side. Born in Lansford, he was a son of the late James and Margaret (Green) Jeffries.Phil was a member of Salem United Church of Christ, Weatherly.He was a 1936 graduate of the former Coaldale High School, where he was president of his class.He attended Kutztown College, the Ford School of Business and Eckels School of Mortuary Science.Phil was one of the first toll collectors at Carslisle when the Pa. Turnpike opened in 1937.During World War II, he was employed by the Atlas Powder Co. in Tamaqua and Ravenna, Ohio.He also worked at the No. 8 breaker in Coaldale and at the former Textron Aluminum Plant, Nesquehoning.Phil owned the Jeffries Funeral Home in Coaldale from 1950-59. In 1959, he moved his family to Weatherly, where he bought the Warner Funeral Home and operated it as the Philip J. Jeffries Funeral Home until retiring in 1985. He also ran the former Jeffries Furniture, Weatherly. Phil was active in the Order of the Eastern Star, having served as Worthy Patron of Mayflower Chapter No. 107, Hazleton, and other chapters in Carbon and Luzerne counties. In 1986, he served as Grand Worthy Patron for the Grand Chapter of O.E.S. in Pa.He was a 50-year member of Ebenezer Masonic Lodge No. 33, Wooster, Ohio, and a 32nd Degree mason in the Valley of Canton, Ohio.Phil was a past president of Weatherly Rotary; a deputy coroner for Carbon County; a member of the advisory board of Blue Cross of NEPA; and served on the board of directors for Hazleton Masonic Temple Association.He was a recipient of the Grand Cross of Color from the International Order of Rainbow Girls.Phil is survived by his wife of 66 years, E. Maxine (Hardesty) Jeffries, of Lancaster; a daughter, Dr. Janet Slovak, and her husband, Dr. Charles "Kif" Weyl, of Mohnton, Pa.; three sons, Philip James, and his wife, Margaret, and Charley, and his wife, Candy, both of Weatherly, and Walter, and his wife, Carol, of Allentown; nine grandchildren, John Jeffries, Lisa Winheld, Amy Lintz, Everett, Jocelyn, Vaughn and Carson Slovak and Kent and Eric Jeffries; four stepgrandchildren, Nathan, Anna, Gideon and Emily Weyl; and seven great-grandchildren, Olivia Winheld, Ian and Annalisa Jeffries, Kreider and Katelyn Lintz, Benjamin Jeffries and Sylas Slovak.He was also preceded in death by two brothers, Elwood and David; and two sisters, Thelma Harvey and Catherine Graeff.Service: Funeral service 11 a.m. Friday, May 8, Philip J. Jeffries Funeral Home, First and Packer streets, Weatherly, with the Revs. Fredericka Beauchard and Donald J. Stump Sr. officiating. Interment at convenience of family, Sky-View Memorial Park, Hometown. Call 6-8 p.m. Thursday and 10-11 a.m. Friday. Order of Eastern Star service 5 p.m. Thursday. Contributions in his name may be made to Salem United Church of Christ, First and Fell streets, Weatherly, Pa. 18255, or to the Shriners' Hospital for Children, 3551 N. Broad St., Philadelphia, Pa. 19140. 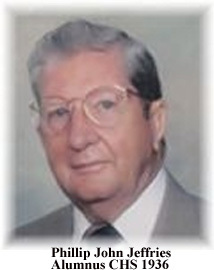 Online registry and condolences may be signed at www.griffithsfuneralhome.com.